"U.S. regulators estimate as many as 10,000 lives could be saved each year if the 911 emergency dispatching system were able to get to callers one minute faster. Better technology would be especially helpful, regulators say, when a caller can’t speak or identify his or her location." We’ve seen the headline time and time again — “Why Can Uber Find Me But 911 Can’t?” Our nation's 911 system was built 50 years ago for landline phones and dated infrastructure has made it challenging to deliver precise, device-based location, to 911 for wireless calls. We are excited to announce a partnership with Uber to better locate mobile 911 callers and provide valuable safety and security for Uber users. Update: At the end of May, RapidSOS and Uber turned on this functionality in several cities across the country. You can see the technology in action in an exclusive Today Show segment on the partnership: "New Uber Feature Connects You to 9-1-1 in an Emergency". Location is the most important piece of information to dispatch appropriate help to an emergency. 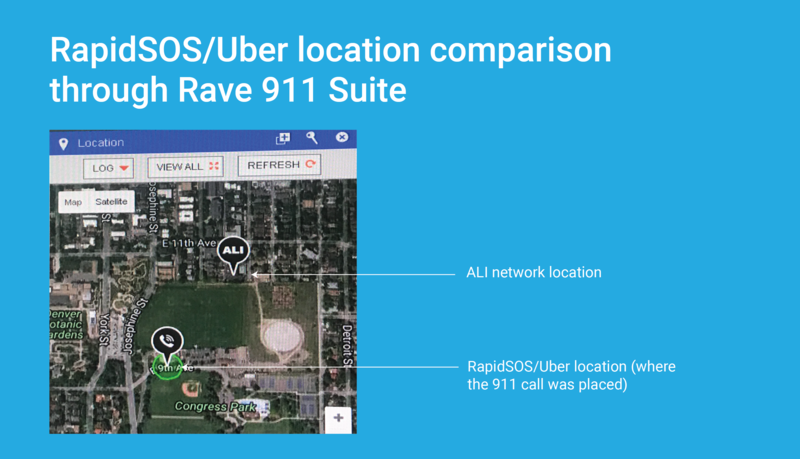 Starting with Denver, CO, when an Uber driver or rider initiates a 911 call via the Uber app's 911 Assistance feature, 911 will receive the user's location from the RapidSOS NG911 Clearinghouse. For 911 call-takers and dispatchers, the location information will be displayed inside their existing call-handling software as supplemental data, in addition to the traditional network location from the wireless carriers. 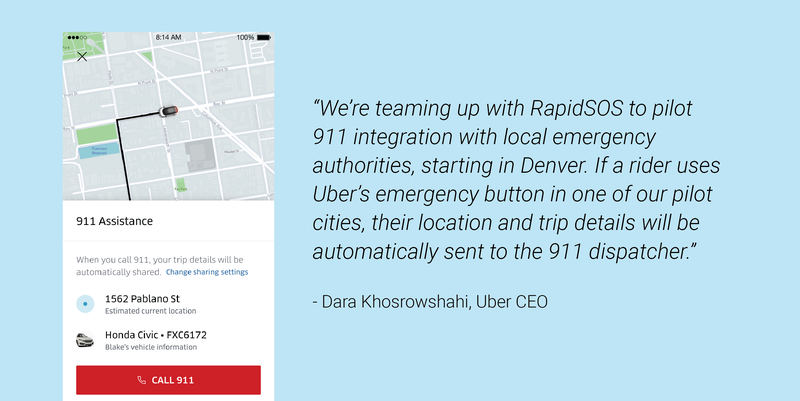 "We are excited to be one of the initial cities to utilize this technology from RapidSOS and Uber," said Athena Butler, Executive Director Denver 911. "We know how important accurate location is for 911 calls, especially for calls placed from moving vehicles where the location is constantly changing. This partnership will help keep our citizens safe and truly has the potential to save lives." Why can’t 911 always locate mobile callers? 911 call-takers frequently receive incomplete or inaccurate location descriptions from callers who are confused, in distress, or unable to verbally communicate. To date, public safety answering points (PSAPs) have had to rely on network-based location information to locate wireless callers. In Phase I, the 911 software provides the civic address of the nearest cell tower or the coordinates of the cell sector centroid. The Phase I location is typically not a “dispatchable location,” meaning it cannot reliably be used on its own to dispatch emergency responders. Phase II location utilizes GPS, which is often very accurate in outdoor environments with a clear line of sight to a satellite, but can have limitations in dense urban settings or indoors. Often, Phase II location falls back to cell tower triangulation which is much less accurate. The greatest challenge for emergency responders is that Phase II location typically takes 30 seconds or more to arrive – precious time in an emergency. Applications like Uber, on the other hand, locate users with a device-based approach that relies on multiple sources of information available on a device (GPS, WiFi access points, etc). Corroborating location information across multiple sources increases accuracy, especially in environments where a single source may be compromised. While using the Uber app, this information is available immediately on the device, so that the location will be available to 911 even before the call is received. How can I receive accurate caller location in my 911 Center?